Kat Bishop belongs to a family of thieves. Her great uncle Eddie is a legend in the field, her dad is wanted by Interpol for all the wrong reasons and her cousin, Gabrielle, is a long-legged con woman through and through. Kat’s best, closest friend is Hale; he’s not one of the family and only became part of Kat’s inner circle when she tried to steal a painting of his. Hale is handsome, debonair, and extremely rich. Everything a girl would want, right? Wrong. Kat doesn’t want to be in the family ‘business’. The book starts with her at a very exclusive private school, Colgan, which she’s promptly kicked out of. Of course she’s been set up, and it all kicks off from there. This book is a caper. It’s cool, smart and flash. Kat and her team criss-cross the continents, there are scenes in Paris, Italy, London and Vegas. It’s difficult to summarize the plot without giving too much away but basically we’ve got Arturo Taccone, a ruthless and thoroughly evil criminal. He collects paintings and has five, by Degas, Raphael, Renoir and Vermeer in his collection. In his very secure collection, in the heart of his fortress home. They have been stolen. By Kat’s father. Taccone wants them back or else. Kat’s father didn’t do it and it’s up to Kat to find the paintings, get them back to Taccone, and maybe teach him a lesson at the same time. Do not mess with Kat Bishop. Ally plays with all the conventions of the genre, like gathering the team of experts (Hale, Gabrielle, the twins Hamish and Angus and the spanner in the works, Nick), the plan and the double-cross. Fans of her Gallagher Girls series will love Kat just as much as Cammie and, as a Londoner myself, I really enjoyed the plan being centred around hitting a London museum, the Henley. A place that makes Fort Knox look like it’s got the security of a Seven Eleven. There’s great team dynamics, and while Kat is reluctant to go back into the business, you certainly get the feeling she knows it’s her natural habitat. A lot of her internal conflict is centred around her not even knowing how to be straight. Her life has been built on lies and deception, it’s hard to know the truth, even about yourself. So if you’re a fan of good people doing very bad things, then Heist Society will be the beginning of a beautiful friendship. But before I kick off the Q&A with Ally I’d just like to thank the guys at Scotland Yard for making this interview happen. Ally’s not an easy person to find. 1. The most noticeable change between your Gallagher series and Kat’s is the swap from First Person (Cammie) to third person. There’s the hint of an unreliable narrator which works perfectly with this being a book about cons. Was this a decision you made because of the style of book, or for another reason? Both. Definitely. Point of view was one of the first decisions I made and I knew it would be a crucial one. On one hand, it was born out of a fear that all of my first person thoughts and narrations would sound like Cammie from the Gallagher Girls and I didn’t want to take that risk. But then, once I considered the type of book it was, I realized that third person/semi-omniscient was really the only way to go because we couldn’t be in Kat’s head 100% of the time. We would have to see what the guards were doing or cut to other members of the crew. Really, I don’t know how I could tell a heist story from just one point of view. 2. You’ve built a great mythology around Kat’s world. I loved the concept of the sacred name, Visily Romani, and all the nicknames the team give to all the various cons, like Avon Lady and Trojan Horse. Was this something that came out of your research or something uniquely yours? Again, the answer is probably both. All of the old, classic cons do have crazy names and that has become a staple of the genre as a result. The specific jobs I mention were made up. And the notion of the sacred name—well, that’s all me as well. But it’s something that, the more I read about these bands of thieves and conmen, made sense with what I’d learned of their world. 3. With Gallagher Girls being very much on the side of law and order (even if it’s a very shadowy side) and Kat’s people very much not, any plans for a cross-over? I’d pay big money to see Cammie and Kat try and outwit one another. I get this question all the time, actually. And it’s a very flattering one. The short answer is: there are no plans to do that at this time. The longer answer is that that is something I’d love to play with but, logistically, I’m not sure how it would work. Point of view, situation—doing something that wouldn’t impede on the overall story arc of either series. Those are some of the practical worries. And I’m a painfully practical girl. 4. The book has a very cool, almost 1960’s feel to it. The cover has a string hint of Audrey Hepburn and the sixties were a period of great caper movies. What sort of style research did you put into Heist Society? I think you’re giving me way too much credit! I didn’t actually think about the style that much, and I’m just the luckiest writer in the world to have the fantastic covers that Disney-Hyperion designs for me. Ultimately, with this book, I wanted to write something that was timeless—something that isn’t dripping with modern technology or lingo. Something that has a great leading lady and a charming leading man because those two things never go out of style. I did watch a lot of heist movies from all eras—How to Steal a Million, The Sting, Topkapi, and The Italian Job and The Thomas Crowne Affair (both the originals and the remakes.) And I basically set out to tell that brand of story...but for the next generation. 5. Can you tell us about Kat’s next big adventure? Uncommon Criminals is the sequel to Heist Society and, as with most sequels, I struggled to make sure that the reader gets enough of what they loved in the first book but with enough fresh material so that they feel like they—and the characters—are moving forward. 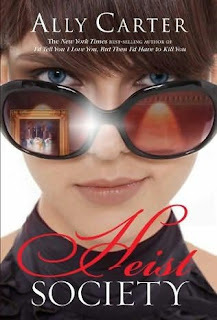 In this book, we learn that word of The Henley Job has spread and Kat has become something of a teenage “wonder thief”. She’s not that surprised when an old woman approaches her about stealing a very valuable, very famous, very cursed emerald. It’s the kind of job Kat would gladly walk away from except for the fact that the woman says Visily Romani sent her. That fact sends Kat on what is maybe her most interesting job yet. I’m really proud of this one and can’t wait for readers to see it. Love the Interview! Love the book! Dying for Uncommon Criminals to come out. Not going to lie, definitely agree with you, I would pay good money to see Kat and Cammie (and their respective 'crews') team up and/or foil one another with conflicting missions. I've already pre-ordered Uncommon Criminals, and who am I kidding: I'm paying good money so I can see Hale and Kat finally kiss. Jeez, did I mention this? I have the best fans EVAH! Tour continues. And they brought pie!